This text is available as a PDF here and a Word document here. It is an honor to testify to you today. My name is Ari Ne’eman – I currently serve as President of the Autistic Self Advocacy Network, the leading national advocacy organization run by and for Autistic Americans speaking for ourselves. From 2010 to 2015, I served as one of President Obama’s appointees to the National Council on Disability, where I chaired the Council’s Committee on Entitlements Policy. I currently serve as a member of the Department of Labor’s Advisory Committee on Increasing Competitive Integrated Employment for Individuals with Disabilities, authorized by the new Workforce Innovation and Opportunity Act statute. I have been asked by Delaware disability rights advocates to join you today to share a national perspective on Delaware’s developmental disability service system. I’ll be sharing with you some data today, coming from three main sources. The first is the State of the States in Developmental Disabilities, a national database of service utilization data managed by the University of Colorado. The second is the Residential Information Systems Project managed by the University of Minnesota. The third is the National Core Indicators Project. All three sources are federally-funded and have data from Fiscal Year 2013. As in most parts of the country, the majority of Delaware residents with developmental disabilities live with their family members. According to the State of the States in Developmental Disabilities, 26% of said family members are over the age of 601, implying a strong need for robust family support services. State of the States data indicates that only 1% of Delaware’s expenditures in developmental disability services goes towards family support services, in contrast to the national average of 7%2. Delaware also significantly under-utilizes supported living and personal assistance services to residents with developmental disabilities, with less than 1% of reported service-funding used for supported living and personal assistance services as compared to a national average of 13%. 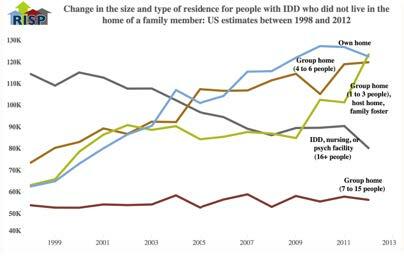 Data from the Residential Information Systems Project suggests that far below the national average of Delaware residents receiving developmental disability services live in their own home or apartment with a lease. These inequities offer an opportunity for Delaware to act to further improve its service system by bringing family support and supported living service funding up to and potentially beyond national averages. As of 2013, Delaware spent approximately $414,683 annually per ICF-DD resident and $92,656 per recipient of Home and Community Based Services waiver funding3, as compared to a national average of $144,609 per ICF-DD residents and $42,713 per recipient of HCBS waiver funding4. The significantly elevated cost of ICF placement is unsurprising and likely the result of the dwindling population of Delaware’s state institution – such settings rely on a high fixed cost structure and it is not unusual to see states in the midst of downsizing or closing their institutions see a rise in ICF per capita costs for the remaining residents. It should not be seen as concerning, given that these costs will go away upon closure of the remaining state institution. Delaware’s higher than average HCBS waiver costs are more unusual and may be the result of the state’s reliance on congregate care models. A number of comparable state systems have achieved better results in community integration at a lower per capita cost. Maryland, which serves the majority of its residents in their own homes or in setting sizes of 1 to 3 people, has a per capita cost of $30,035 per HCBS waiver recipient5. New Hampshire, which serves the majority of residents through a combination of own homes, host homes (or shared living arrangements) or settings of 1 to 3 people, has a per capita cost of $47,488 per HCBS waiver recipient6. Nationally, there is an ongoing shift away from congregate care, towards more people with disabilities living in their own home or in settings of 1-3 people. Research has demonstrated that congregate care settings significantly impair the choice and control of people with developmental disabilities. Such settings are also likely to cost more for the majority of residents, given that congregate models set service levels to the needs of the resident with the most severe level of impairment. In short, if one resident requires 24/7 care, staffing will be structured so that all residents receive it, even if some may benefit from less intensive and restrictive levels of service. While congregate care has some cost advantages for individuals with the most significant levels of impairment due to economies of scale, such economies also deprive residents of choice and control as their autonomy takes a backseat to the challenges providers face attempting to meet the needs of multiple residents with high levels of need. We believe that it is precisely for individuals with the most significant disabilities that the loss of choice, control and person- centeredness in service-provision that comes with congregate models is most risky and thus strongly advocate for more community-based service provision for this population. Far from congregate care being necessary for those with the most severe disabilities, it is exactly this population that is most at risk from it. Since congregate models norm services to the resident with the highest service need, typically shifting away from congregate models can realize cost savings for a significant majority of residents leaving for more individualized models, such as supported living services. 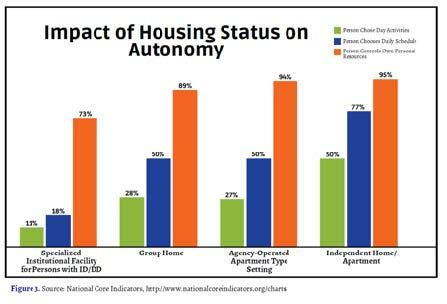 Supported living is also considerably more likely to achieve greater community integration and choice and control within community life, consistent with the new federal HCBS Settings rule from CMS. Source: Lakin, Doljanic, Byun, Stancliffe, Taub & Chiri. Choice-Making Among Medicaid HCBS and ICF-MR Recipients in Six States. American Journal on Mental Retardation. Vol 113, No. 5: 325-342. September 2008. 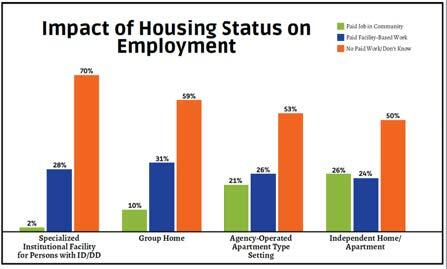 Data from the National Core Indicators project, the largest multi-state quality management project for developmental disability services with thirty-nine states participating surveying thousands of adults with developmental disabilities, parents, guardians and service-providers, found that autonomy and employment outcomes are substantially impacted by housing status, with residents of independent homes and apartments (the typical location of supported living services) approximately twice as likely to choose their own day activities, fifty percent as likely to select their own daily schedule and significantly more likely to have a paid job in the community than residents of group homes or even agency-operated apartment settings. 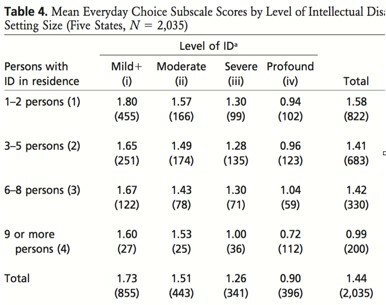 These are all critical outcomes associated with compliance of the new federal HCBS Settings rule – and a composite score of measures of choice and control derived from NCI across six states found that choice scores improved or held constant in smaller settings across every level of intellectual disability. Delaware should look to shift its services to less congregate models of service-provision, moving away from group homes and sheltered workshops and towards supported living, supported employment and other similar services aligned with the requirements of the new CMS Home and Community Based Settings rule and best practice in disability service-provision. In order to facilitate this transition in a responsible way, the state should commit to reinvesting cost-savings into rental subsidies, health care infrastructure and other investments necessary to facilitate community integration for people with developmental disabilities and their families, such as family support, integrated day services and supported employment and other validated or emerging service models. We are in the midst of a number of significant and important shifts in developmental disability services. From 1960 to 2012, 207 state institutions for people with developmental disabilities were closed. Unlike the corresponding process in mental health – which suffered for lack of adequately funding community services – de-institutionalization of people with developmental disabilities resulted in a robust community service system and consistently better outcomes for those leaving institutions. However, in the 21st century, we are coming to realize that some of the models adopted in previous decades, such as group homes and sheltered workshops, will not represent the future of developmental disability services. Some of these changes may result in cost-savings, while others – such as the expansion of supported employment services – will require new investments. I’ll note that some of those investments the state is already pursuing, such as Delaware’s innovative Pathways to Employment 1915i state plan benefit. However, regardless of the cost structure involved, it is important to prioritize these changes as an issue of quality, respect and the civil and human rights of citizens with developmental disabilities. Such an approach will serve Delaware well and offer an opportunity to build upon the state’s existing successes in developmental disability service-provision. Thank you for your time, and I would be glad to answer any questions you may have. Should you wish to reach me, I can be contacted at aneeman@autisticadvocacy.org or at my office line at 202-596-1056. This entry was posted in News and tagged community living, inclusion, testimony. Bookmark the permalink.